Samsung’s monster 55in OLED TV, which debuted at the International Consumer Electronics Show in January, will launch in the UK this spring. OLED technology is currently used for some high-end smartphone displays, but it’s taken TV manufacturers quite a while to reproduce the same quality on a much larger screen. In 2012 though, the latest OLED panels, which will also include a 55in model from LG, are set to land and promise to deliver less power consumption, perfect response times and ultimate picture quality. The technology is also able to differentiate varying degrees of blacks and shadows, so that users can enjoy tiny details even in the darkest of scenes. Samsung’s new ultra-thin TV also boasts some great new features, including active-shutter 3D and the company’s own Smart TV technology, which includes voice and gesture control through a camera and a microphone integrated into the chassis. The TVs are expensive to produce, so a pilot-run is expected in the spring, followed by the launch of more units by year end. 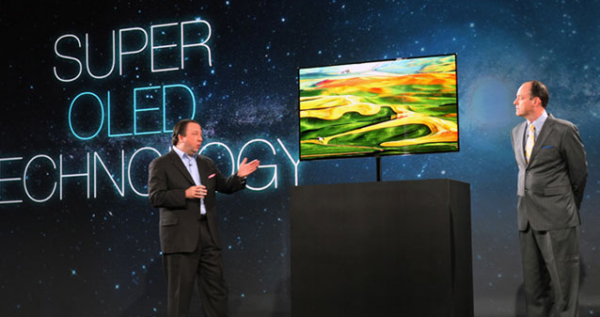 Sources suggest that Samsung plans to mass produce the TVs by 2014. You better get saving though; Samsung hasn’t revealed pricing yet, but the 55in panels are expected to cost upwards of £5,000. Happy to wait for lots of early adopters to buy them first, and then buy one when prices have come down to around the £2K mark. 5k, thats not bad at all… in the context that this is the first large sized OLED display(as is LGs) and it has 3d tech etc. The kuro which is still the pinacle of plasma displays was mighty expensive on release and plasma had already had a few sales years before its launch so wasnt spanking new, just the best and i think it was ~£3k, so £5k for a brand new tech at 55" with 3d stuff and all the niceties that comes with OLED isnt bad for early adopters, i can see this getting to £2k by 2014 if not 1k!. Sounds good, hope you're right. +1 - but I really do hope this OLED tech properly kicks off and is here to stay - few years down the line i'll be able to replace my plasma with a 4k oled screen… that'd be perfect!